Image Size: 68 x 48 in. Paper Size: 68 x 48 in. 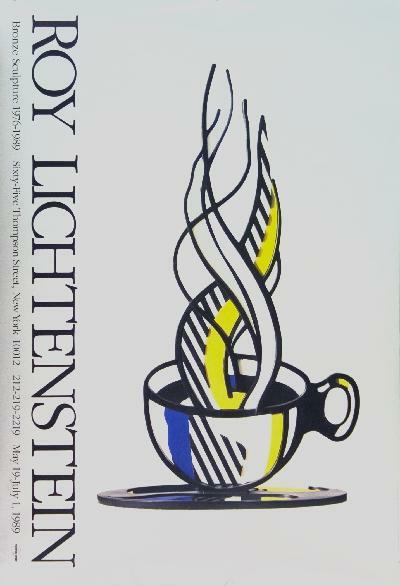 Dynamic Lichtenstein Cup and Saucer Offset Lithograph. This is a wonderful exciting Offset Lithograph, Original Exhibition poster, very large offset lithograph, billboard size. Unsigned and not numbered. This stunning piece is an original exhibition poster by Lichtenstein to advertise his sculptures at the Leo Castelli Gallery in New York in 1989. These kinds of brilliant advertising posters havent been reprinted and have become highly sought-after by collectors of contemporary print and fine artworks. Limited Edition features sophisticated brilliant color tones in this print, excellent! Click the button below to add the Dynamic Lichtenstein Cup and Saucer to your wish list.